Video: Defund Dakota Access Pipeline! Defund DAPL, Paul George 2-11-2017 from Joan Simon on Vimeo. 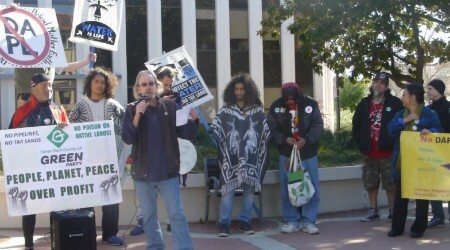 PPJC’s Director, Paul George, speaks at the Defund DAPL rally on 2/11/17 in Palo Alto. A complete list of banks which are funding the Dakota Access Pipeline can be found here. This entry was posted in Videos and tagged #NoDAPL, Dakota Access Pipelne by PPJC Admin2. Bookmark the permalink.